One of the things I enjoy while on vacation is talking to the locals. They are usually wonderful sources of information about the area we are visiting. This is particularly true at a Disney property. The cast members are a fascinating bunch. How they came to work for The Mouse, the history of the park or hotel, and what's coming next are all topics that I love to cover. On our recent trip, I chatted with three cast members who were particularly special or interesting. 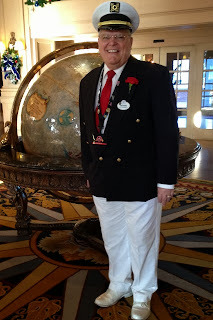 My first shout-out is to Richard, the official greeter at the Yacht Club resort. He was so jolly he reminded me a bit of St. Nick. He shared insights about the train and village display in the lobby, how to get rid of red ants, and bits of his personal story. Our second acknowledgement goes to a delightful woman at World of Disney. Sadly, we don't remember her name but she stood outside the store holding a Duffy stuffed toy and advertising a donation program the store was promoting. From her we learned of Disney Springs, a revamp of Downtown Disney we had somehow missed hearing about. Finally there was an interesting man in Hollywood Studios at the Legend of Captain Jack Sparrow attraction. He chatted about the rumors of updates to that park, the ebb and flow of the number of guests, and his kids. Friendly, pleasant cast members were in the majority but we ran into something new this year: surly, gruff, and irritated employees. While surprised by the overtness of this non-Disney behavior, we realized that what we were seeing was exhaustion. Coming off the Thanksgiving weekend and moving into the holiday season, these cast members were just plain done-in and had been bumped with a stroller one too many times. We witnessed a lot of communicating while on this trip. We spoke to cast members, they spoke to each other, and the Disney company spoke to all of us. We generally liked what we heard however we couldn't help but feel sad that the corporation had stretched the manpower in the parks so thin that nerves frayed and tempers flared. That communicates so much to employee and guest alike. Much of our success or failure in communication can be found in first impressions. As much depends on tone, facial expression, and body language as on the words themselves. We build a reaction to someone or something predicated on the first encounter. And so it was with our recent vacation. Due to terrible motion sickness, I don't fly well and I am often a bit rattled on landing. I couldn't wait to get to our hotel to freshen up and get something to eat. This was our first experience with Disney's Magical Express, the complimentary transportation from the airport to the Walt Disney World resort. The bus driver, we'll call him Sam, was all smiles when we boarded however that disappeared as he contended with heavy holiday traffic and blown schedules. None of his ire was directed as his passengers but it was a surprise that he would be so vocal about his distress. Upon arrival, a Disney hotel cast member greeted us by name and escorted us into the hotel lobby. Her smiling face and cheery demeanor were as bright as the Florida sunshine and did much to erase the tense beginning to our vacation. I sympathize with Sam. Traffic back ups and delays are frustrating. We live in the Chicago area and we always speak about our commutes in terms of time, not distance. We know about bad traffic. We had a different driver when we left so we didn't see Sam again. We will always wonder if things improved as his day progressed. We certainly hope so. And, although we always looked for her whenever we passed through the lobby, we never saw the hotel greeter again either. Two people, two impressions. The manner in which they communicated with us will be with us forever. There is no way to know how our clients or customers feel when they encounter us. We don't know what happened to them prior to meeting with us so how we initially communicate with them will impact them in ways we cannot imagine. Our vacation experience reminded me how important it is to strive to make that first impression a good one. I just returned from a trip to Walt Disney World in Florida. A close association with The Mouse is often assumed because of my name however it's been eight years since my last excursion to Orlando. This was a complete vacation - no emails, no phone calls, no touching base with the office, and very few tweets. The trip will be the subject of the next few blogs because I saw plenty of communication in a variety of forms and all of it was fascinating. Of course electronic and digital forms were plentiful and influenced much of what I encountered but that's not the whole story. Probably no one pushes a brand better than the Walt Disney Company. Children are indoctrinated at an early age and the corporation works hard to make that carry through from generation to generation. Consider one grandmother's story about her daughter-in-law paying the one day park admission in order to get a photo of her newborn in Minnie's arms. The grandmother was beaming. If he were to hear about it, Bob Iger, CEO of the company, would be too. In coming posts, I will consider how cast members responded to guests, how the corporation relates to its customers, and what was good or unfortunate in all the factors that combined for the show I observed. To top it all off, snow at O'Hare Airport provided an entirely new experience. Like I said, it was a very interesting eight days. I'll take some time to reflect and compose my thoughts. Please stop by next week when I will begin the series.